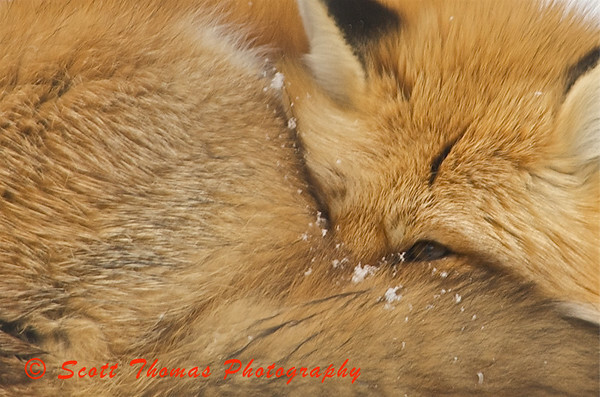 Red Fox curled up for warmth at the Rosamond Gifford Zoo in Syracuse, New York. The thermometer was reading 12 degrees Fahrenheit with the wind chill at -18F last Saturday and, of course, I choose to go to the Rosamond Gifford Zoo in Syracuse, New York. The zoo is running their annual winter photography contest with free admission for people who show a coupon and their camera. I figured since it was a typical central New York winter’s day, it was a good day to get winter photos at the zoo. I took over 300 photos during the day but can only submit 2 for the contest. After culling out the days take, I looked at what was left and the Red Fox (above) and Caribou (below) photos kept catching my eye. Though both needed cropping to tell the story I wanted to convey, I think both photos show what winter life is like for these animals at the Rosamond Gifford Zoo. 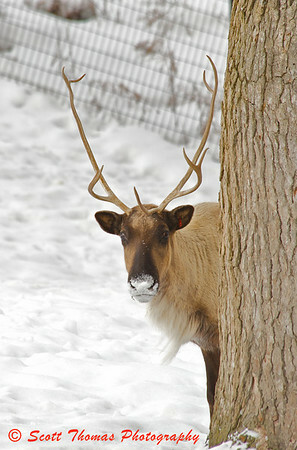 A camera shy Caribou at the Rosamond Gifford Zoo in Syracuse, New York. This entry was posted in Animals, Weekly View and tagged caribou, contest, new york, Photography, red fox, rosamond gifford, syracuse, winter, zoo. Bookmark the permalink. Those are both great! I wouldn’t mind having a fur coat like that fox has right about now! Both excellent shots! Good luck in the contest! Great choices! I really like the fox. Good luck in the contest!! When do they announce the winner? The fox is a great shot! Especially with that one wary eye peeping out. Very nice. These are beautiful…the first one is just precious. Goodluck with the contest. Sorry I wasn’t able to participate in the Assignment. I’m setting up my new website, and I want to post it there. Next time then. The contest entry deadline is next week. They’ll be announcing the winners on February 20th. Thanks for the good wishes and luck. This is a great promotion by the zoo to get people there in the middle of winter. Even in the harsh weather the day I was there, many other fellow photographers and families were walking around and enjoying the zoo. MrG, I see what you are saying. However, I like seeing the Caribou’s leg, body and neck and decided to submit as is. Rico, that’s okay. Maybe next time. Don’t foget to send me the new link to your blog when you have it ready. I vote with the majority – the fox wins. Great shot.